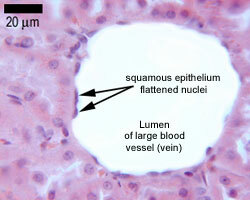 simple squamous epithelium is a single layer of flat scale-shaped cells. Both the endothelial lining of blood vessels and the mesothelial lining of the body cavities are simple squamous epithelium. Try to identify the simple squamous epithelia in these pictures. It can have an excretory, secretory or absortive function - i.e. in salivary glands. This image opposite is of ducts in the kidney, which are lined by simple cuboidal epithelium. 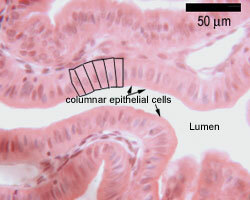 This picture shows columnar cells from the stomach. A few of the cells are outlined, to help you identify them. This is a single layer of cells, and the cells are all tall columnar. Tall columnar epithelium lines the ducts of many exocrine glands. This type of epithelium is adapted for secretion and/or absorption, and can also be protective. Simple secretory columnar epithelium lines the stomach and uterine cervix.The simple columnar epithelium that lines the intestine also contains a few goblet cells. 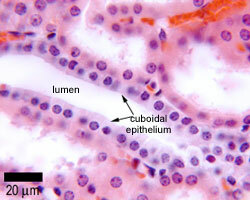 In histological slides of pseudostratified epithelium, it looks as though some of the cells are not in contact with the basal lamina, and the nuclei are at different levels. So it looks as though there is more than one layer of cells. However EM shows that all the cells contact the basal lamina, so this is a 'simple' epithelium. But it is called pseudostratified, because of its appearance. Pseudostratified ciliated columnar epithelium containing goblet cells lines most of the major airways. This is an example of pseudostratified epithelium, from the trachea. All the cells are attached to the underlying basement membrane, but the nuclei are at different heights, giving the appearance of a 'stratified' epithelium. Hence this is a 'pseudostratified' epithelium, as it is in reality a single layer of cells. Make sure you can identify the goblet cells. What shape do the rest of the epithelial cells have? (squamous, cuboidal or columnar? ), what specialisations do they have? 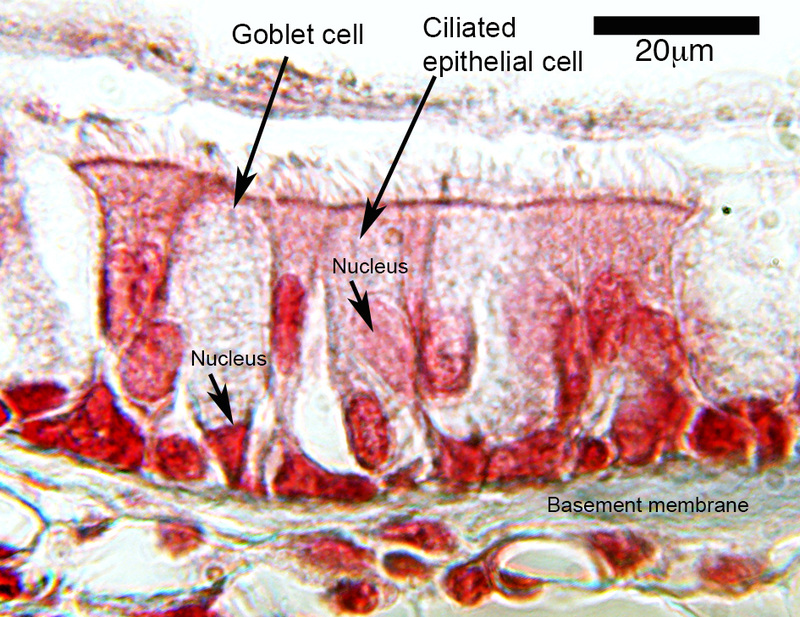 Note how the goblet cells are very weakly stained due to the mucus that they contain.